My Maui Zaui Polynesian Pizza Sauce recipe is a work in progress, but I’m glad to share my progress with you! This recipe is much closer than my last go-round. The recipe still is not quite right, but pretty close & pretty tasty! As I’ve mentioned in a previous post, we love Round Table Pizza’s Maui Zaui pizza. They use a sauce called Polynesian sauce that is very good, sweet & spicy, and I’ve been trying to recreate the recipe for some time. If anyone makes this recipe, and has any notes to share, please add a comment or email us at cookplantmeditate@gmail.com – I’d love to hear from you! Need a fabulous pizza dough recipe too? Check out Trish’s recipe here! Soften onions & garlic in olive oil with a dash of salt, then mix in all ingredients. Cook over medium to medium-low heat for 20-30 minutes, or until reduced & thickened. Spread on homemade pizza dough, top with whatever you like! Tags: food, homemade maui zaui sauce, homemade pizza, homemade round table maui zaui pizza, maui zaui, maui zaui pizza sauce, polynesian sauce, recipe, round table pizza. Bookmark the permalink. Previous post ← Would you like some silicon dioxide with that? I tried this sauce last week and it is a very close match. I am impressed. My husband and kids liked it too. The recipe makes enough for 3 – 4 pizzas. Thank you for experimenting and posting this recipe! Thanks so much for trying this! I’m really glad you enjoyed it! Keep on woгking, great job! Iv’e heard this sauce is 1/2 ranch. and 1/2 thai chili sauce, easy and simple. try it! This recipe was great. It gave a great fresh taste to evrerything. I just so had a pineapple and oranges around, so I squezed everything. All the ingredients were very fresh and sweet so I added more ginger. And I added tomato paste to thicken the paste up and give a thicker base. This worked great on a flat bread. Thank you. Made this last night, and it was so delicious! I added a heaping tablespoon of cornstarch to mine as it didn’t get as thick as I liked even after reduction. Will definitely make it again. Thanks for sharing! I’m so glad you enjoyed this recipe! Cornstarch is a great tip – thank you!! Thank you so much for sharing your recipe for Maui Zaui Polynesian sauce. I’m using it for a triple birthday party for three ladies including myself in December 2017! We’re having a luau in December, LOL, and one of the ladies really wants pizza. Thank you for this recipe! 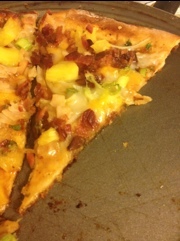 My husband and I took a once in a lifetime trip to Hawaii this summer, and I fell in love with the Maui Zaui Pizza at Round Table Pizza. I brought a menu home with me so I would know what toppings were on the pizza. I can’t wait to try this! Very close and we truly loved it so thanks for sharing, I think next time I am going to add about a tablespoon of red chilly flakes, like you I wanted spicier however this recipe was outstanding and my family loved the pizza so thanks.